Laura Elisa Pérez, associate professor of ethnic studies, author, and the only Chicana scholar tenured in the College of Letters and Science at the University of California, Berkeley, will present a lecture titled, “Undocumented Flower Crossings, Walking Altars, and Latina/o Art” on Wednesday, Oct. 8, at noon in room 114 Bird Library. For more information, contact Pedro J DiPietro at pjdipiet@syr.edu. Timed to coincide with National Hispanic American Heritage Month, Pérez’ lecture is presented by the Department of Women’s and Gender Studies in the College of Arts and Sciences and the Office of Multicultural Affairs, the lecture is cosponsored by the departments of Art and Music Histories and Religion, La Casita Cultural Center, Latino and Latin American Studies, Lesbian, Gay, Bisexual, and Transgender Studies, the LGBT Resource Center and the Office of Cultural Engagement. 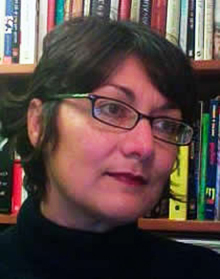 At Berkeley, Pérez is also a core faculty member of the doctoral program in performance studies, an affiliated faculty member in the Department of Women’s Studies and the Center for Latin American Studies and former director of the Beatrice M. Bain Research Group on Gender. She is the author of the forthcoming “Ero-Ideologies: Writings on Art, Spirituality and the Decolonial” and “Chicana Art: The Politics of Spiritual and Aesthetic Altarities” (Duke University Press, 2007). Pérez earned a Ph.D. from Harvard University and a master’s degree from the University of Chicago.